Now that the basketball season is a wrap, and with hockey soon to follow, only one of the four major North American seasonal sports, Major League Baseball, will be in session. While the great American pastime certainly carries with it a tradition which is engraved in the hearts of millions, the dog days of summer can get repetitive in the nationally-televised sports world, as diving catches and cannonball home runs take sole possession of center stage on ESPN. By the third instance of a 4-6-3 double play in the SportsCenter Top 10, viewers find themselves rolling their eyes with the reluctantly accepting frustration of Lester Freamon in the pawn shop unit. Baseball aside, we turn from focusing on seasons to singular, annual events in sports. With tennis, Wimbledon and the U.S. Open await, as Rafael Nadal, Roger Federer, Novak Djokovic and Andy Murray continue to stake their claim that this is the golden age of the sport. In golf, the final two majors will again seemingly pit Tiger Woods vs. field, as has been the standard for the last decade and a half, despite Tiger’s dreadful recent performance in the U.S. Open at Merion. The FIFA Confederations Cup continues to unfold amid a sea of protests in Brazil, as citizens of the host nation have taken to the streets to express their anger with the government over high taxes, corruption and a general sense of dismay in the state as it prepares for the World Cup next year. While all of these events happen during the course of a season or at least as the result of past performances, one annual sporting spectacle which will occur this weekend, and subsequently be ignored by most of the mainstream American media, is a truly singular, stand-alone affair. 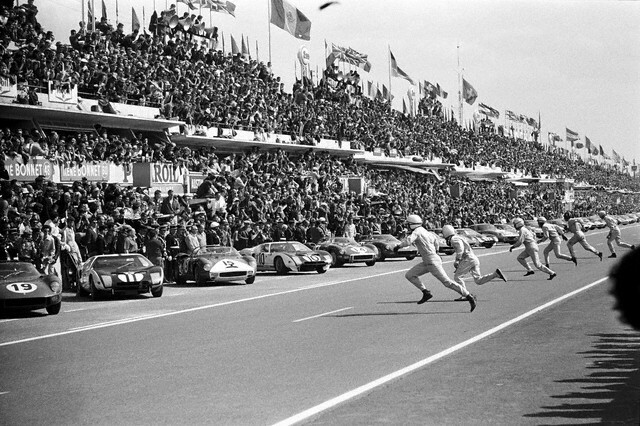 Every June, the 24 Hours of Le Mans invites fans of motorsport to a town a little over a hundred miles southwest of Paris and engage in the revelry surrounding the world’s oldest and most beloved endurance race. This year’s edition will be the 81st running, and while the betting man’s money probably falls on the Audi Sport Team Joest combination of André Lotterer, Benoît Tréluyer and Marcel Fässler to win the race for a third year in a row (take that, South Beach Big 3), the tradition of the event is really what makes it special. Having begun in 1923 on pieces of public road in Le Mans, a town bordering the Sarthe River, the race has survived the Jazz Age, the Great Depression, the Nazi occupation of France, the Cold War and the release of Yeezus. From 1923 until 1969, the race started with drivers running to their cars on the other side of the track and pulling away as quickly as they could. Realizing the unnecessary added danger this created, the Automobile Club de l’Ouest, the organizing body of the event, eventually settled on a more conventional rolling start combined with the waving of a French tricolor. The 24 Hours of Le Mans is a test of will and perseverance. Simply finishing the race is a remarkable achievement; of the 56 cars which qualified for the 2012 edition, 35 finished, only 33 of which finished well enough to classify (any entry must complete 70% of the number of laps the overall winner completes). The unique challenges involved in taking a single, powered machine and running it for 24 hours straight stretch the limits of human comprehension. Just ask anyone who has stayed up all night playing Halo or FIFA. Adrenaline keeps the human going when weariness begins to set in, and the short naps in between stints behind the wheel offer a brief respite from the tumult in pit lane. Tensions run high and become sustained, increasing with every minor glitch and major catastrophe which may put completion of the task at hand in jeopardy. Spectators enjoy the festival-like atmosphere all over the Circuit de la Sarthe, embracing a frantic madness and then retreating to nearby hotels or bed-and-breakfasts. When the morning comes, the people who have been awake all night reward fans with a paced charge to the finish, and teams that have conserved their resources can start to feel more comfortable in survival. This weekend witnesses the renewal of the world’s oldest endurance race, and it promises to be a competitive battle across the board. The 24 Hours of Le Mans is not susceptible to the hype and broken promises of Formula 1 or the “they only turn left!” criticisms inherent in NASCAR and American open-wheeled auto racing. This race, an annual reminder of human determination and its limits, challenges some of the world’s foremost drivers and people who have enough money to pretend that they are. Bearing witness to the tenacity of the people involved, drivers and crew alike, speaks to the human spirit and the all-important athletic quality of “heart” as well as calling to mind one of Aesop’s most famous fables: The talented hare speeds to the front, but the steady tortoise wins the race.